I'm pretty sure most of the technical details of ED are covered on this site so I'll give a brief rundown of the major points as I see them. I live in Southern California so finding a dealer willing to do an ED and get another allocation was no problem. The dealer I chose was in Long Beach and they were very easy to work with although they only do ED once in awhile. Even though ED is listed as "free" option, it actually costs the dealer $3000, so don't expect to get the same discount as if you are buying off the lot late in the year etc. We originally tried to get delivery in Leipzig but due to the Macan production they told us they couldn't book and confirm delivery there until late June so we opted for Zuffenhausen. In addition to placing an order and getting a build slot the dealer must work with PCNA and PAG to secure a delivery date at the factory since there are only a few slots per day and summer is usually very busy. Also keep in mind the factory shutdown in August which could impact your desired delivery date. Once you have an idea your delivery date is available, you place the order and give them a deposit, typically $2000. During the time before your order gets approved and locked down you have a few days to make changes. I didn't, but they let me know I had a few days to make changes in case I woke up in a cold sweat and absolutely had to add an option or my life wouldn't be complete. Since my build was more or less a standard car with very few options I was locked down in a few days. If you are ordering custom stuff or have deviated stitching, leather air vents, it's possible your approval and lock down cycle will be longer. So after paying the deposit, you more or less go away for several months and plan your trip until the dealer or PCNA calls you to sign some power of attorney forms and more paperwork stuff needed to register your car in Germany. Initially my dealer was going to take a 20% VAT in addition to the down payment but when I went in to sign the final loan paperwork they told me they would cover it. So that was my VAT experience but I've heard others had to pay a VAT deposit or the whole thing and then wait until the car was shipped back to get their refund. with all the detailed info about your hotel, 2 taxi vouchers, directions to the plant, and some stickers and other cool things that make you feel very special and important (until you realize you already paid for it in the price of the car). 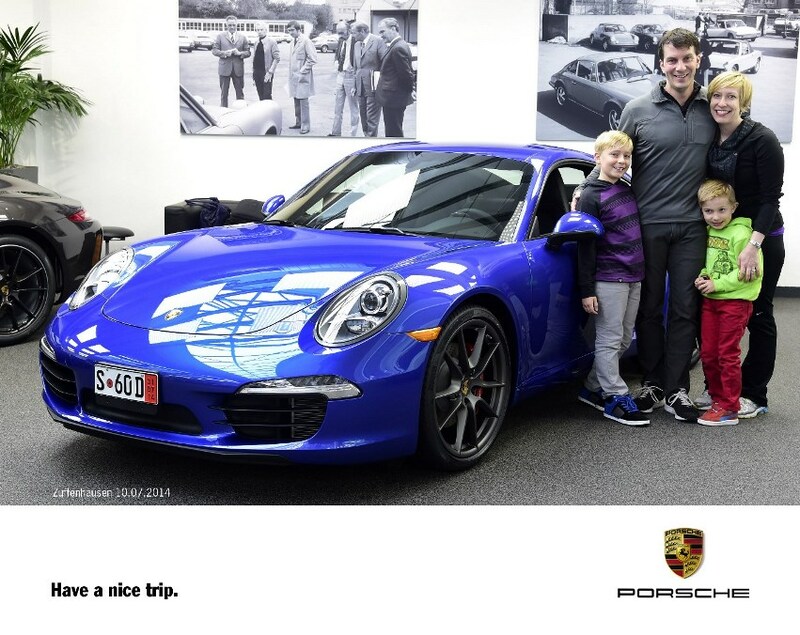 But no matter it's just the beginning of how they treat you in the Porsche Family. At that point, you are pretty much ready to go. We flew in to Stuttgart on a Wednesday took the S-Bahn to the Hauptbahnhof and stayed in the AM Schlossgarten. It was a very nice hotel all within walking distance to lots of tourist sites in downtown area. At this point I should probably mention we took our two boys ages 5 and 8 with us, so if anyone is wondering if youcan do a Euro Delivery with two small kids and all the luggage in a 911 the answer is...YES! It was a little cramped but we had a plan of attack that worked well which I will elaborate on a little later. On the Thursday morning of delivery we took a taxi from the hotel to the factory collection office. It took no more than 15 min and we arrived about 8:10AM for a 8:30AM start time. They have some small pastries and coffee there but I suggest eating a full breakfast at the hotel before heading over for collection. Our delivery specialist was Louis. I'm pretty sure Louis was an American ExPat, possibly from Brooklyn, although he spoke perfect German when he needed to. After signing more insurance forms and paying for the extra week of insurance (which was 325 euro instead of 288 euro as PCNA stated) we went to see our car for the first time. We had to walk past 20-25 other cars waiting to get delivered before getting to the "showroom" spot where they had about 10-12 cars lined up presumably for that days delivery. The first thing they do is take a picture of you and the car, and then your delivery guide spends about an hour with you going over the PCM, the mutlifunction display, the first aid kit, how to close the trunk properly. Honestly it was overwhelming and I don't remember much of what he said, espcially since our two boys were bouncing off the walls and super excited to be around so many Porsches within arms length. I didn't find the handover to be that important since everything they tell you is already in the manual. At that point it is about time for the 10:00AM tour, so after loading up our car with about 200lbs of luggage in the "Porshelf" and "Frunk" we drove all of about 100 yards to the customer parking outside. Driving out of the delivery garage was nerve racking, as you have to negotiate not only the $2,000,000 worth of tightly packed cars around you but make a 90 degree turn into a narrow garage opening and then another 90 degree turn out onto a narrow driveway. To make matters worse there was a Porsche employee painting the guard rail of the driveway as I was pulling out. Louis was kind enough to have him stop while I drove out into the parking lot. So after parking you return to the factory collection office for the tour and surrender your cell phones to the guides who will take you on a 90 minute journey to see how Porsches are made. There is so much to describe it would take days to write it all down, but it's better to be surprised if you are going to do an ED. If you are not, you can always watch "How It's Made" dream cars and they do a pretty good job of showing you what is on the Porsche factory tour. I will say that the tour is well worth it and it will give you a new perspective on your car. It kind of takes away some of the magic since you are seeing 100's of 911's being built, but it also instills you with the confidence that this is not some kind of ultra cranky exotic meant to be babied. It's meant to be driven and enjoyed and experienced, after all it's ancestors were the very pedestrian VW Beetle. So in my opinion the tour took the car off the vaunted "sports car pedestal" and allowed it to be a bit more human and approachable. 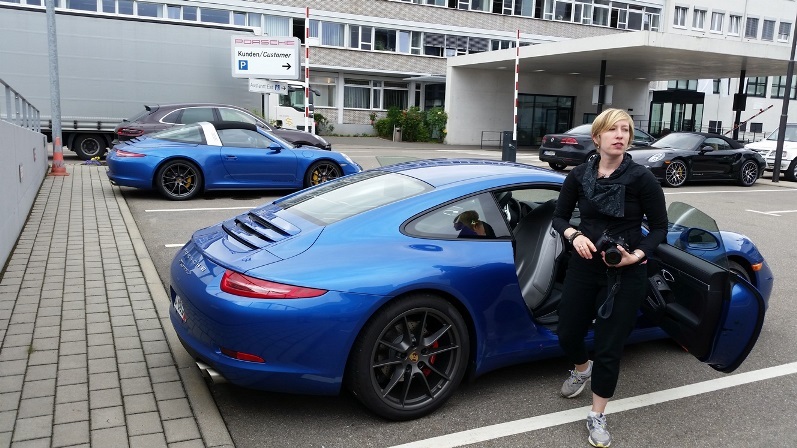 Since our kids were not old enough to go on the factory tour (ages 12 and up in Zuffenhausen), they got to go on a special tour of the Porsche Exclusive factory, where they got to see the leather air vents and leather tachometers being made. They also got to go to the separate 918 Spyder delivery center which is behind glass and completely separate from the regular delivery area. Since that tour only lasts about 30 minutes they also have an X-box the kids can play and a bunch of Porsche ride on toys to zoom around on while they waited for us to return from the main tour. By the time the tour ended it was time for lunch at the top of the "Casino". Of course this was a gourmet lunch and my kids ate none of it, so the nice lady serving us brought out some Schnitzel and Weiners with Pomme Frittes. After finishing lunch you are pretty much wiped out and we had to drive about 200Km to Dinkelsbuhl northeast of Stuttgart to get to our rented condo, so we decided to have them hold our Porsche museum passes until the day we dropped off the car. That way we could have more time to relax and enjoy the museum without being rushed. At that point it is just you, the car and the road. Unfortunately for us it was raining heavily and our first 60 min in the car was white knuckle driving up until about Crailsheim where it cleared up. Even so, the car felt planted and secure in those conditions even loaded up with luggage and kids stuffed in the back seat. Here are a few picture from the factory collection day and I'll post more on this thread in the coming days about more of our experiences and tips on how to do Factory Collection of a 911 with kids. Thanks for sharing and welcome aboard. I was a lurker for 9 months before finally getting around to joining today. This is a great site and compared to other automotive enthusiasts sites pretty much everyone here seems to be intelligent, kind and generally helpful to others. Although I never asked for advice, I read with great interest about everyone's experiences and recommendations as to how to properly spec a car for your overall driving intent, enjoyment and climate. In my case I went for a more stripped down build for reasons of cost, weight savings and future repair bills. Thanks for sharing. And what a nice choice of color!! Congrats! BTW, your username is cool and funny. It sounds like "huge hard-on". Last edited by coxswain; 09-24-2014 at 11:23 AM. Great adventure. Thank you for sharing and that is a great looking car! I enjoyed reading your narrative and look forward to reading more about your trip. Brave man bringing the kids along. Imagine when their turn comes 30 years from now, they'll be able to do the same factory tour, watching as their cars are 3D printed, reminscing over that first 911, the car with the pedal and buttons that couldn't even read your mind. Thanks for the great write-up! Nice choice of color!! Congrats! Your username is cool and funny. It sounds like "huge hard-on". This from the user whose userid sounds like "***** swayin'"? Sorry. Had to. To the OP, huge congrats and thanks for sharing. Beautiful pcar and pfamily. Enjoy. Yes, that's why I sensitively noticed his username "Hugh Jardon". Last edited by coxswain; 09-24-2014 at 11:26 AM. Love that blue color. Platinum silk wheels match it very well ! That's a wonderful piece of journalism, Hugh, thank you for posting it. Location: At the track. I reside, however, in Navarre, FL. Sorry we let the children out, Hugh. Ignore them. Impressive write - up and congrats! Really nice selection, I like the approach reasons of cost, weight savings and future repair bills. The blue onblack looks superb and I'd have configured the car much the same way. Congratulations, that's a great memory. Great write-up! Thanks for sharing this! Your car looks gorgeous - I love that blue!! !